Are you ready for a recipe that combines brilliance and vulgarity? Read through the recipe for the “Swedish Sugared Sweet Pretzels,” from the February 2016 issue of Food & Wine, and understand that you need to set aside a few hours for yeasted dough to rise and for you to shape this dough into pretzel shapes. Oh, it is so worth it. What pulled me in, here? I’ve never made pretzel-shaped anything. This project involves yeast, yet it’s not bread (there’s no kneading). I got to use my stand mixer’s paddle attachment (a nice change of pace). You need to treat yeast as the living thing that it is, and not kill it in its warm milk bath. I made sure to take the temperature of the half-cup of milk that I microwaved, so that it was no hotter than 115 degrees F. Easy, so far. Let the warm milk, yeast and teaspoon of sugar “stand until foamy.” Yes! Smell that yeast, the thrill of it. I put my ear to the bowl, hoping to hear its activity. Next, the mixer will grind and groan with all of the sugar and eggs and flour and butter, turning the dough from “shaggy” to “shiny.” I had pieces of dough flying all over the place, so I covered my mixer with a towel. It was a crazy mess. My final ball of dough doubled in bulk in 90 minutes. After that calming period, I rolled out my dough, spread it with more butter, then cut it into strips. Here’s where I got crude. Using my “pinnulata” mentality, I rolled and stretched my dough strips, then mangled them into ugly fat pretzel shapes. Note to self: don’t bother with pretzel shapes. Next time, tie the ropes of dough into knots, instead. The pretzels rested for another 30 minutes. The baking is easy: 12 minutes. 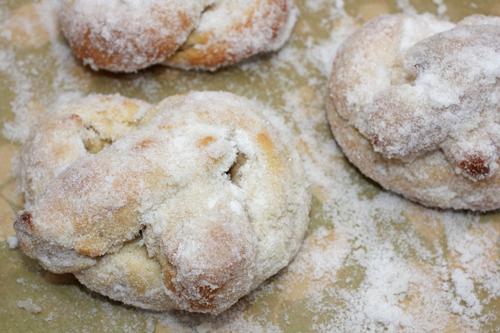 One and one-quarter cups of sugar is way too much, but it is powdery and lovely on the baked, butter-brushed pretzels. Ready to take a bite? Bring the pretzel up to your face, inhale, bite, and taste the breadiness, the butter, the sugar. It’s like soft fresh bread, addictive. I want more and more. The cardamom only seals the deal. Here’s where I forgive my vulgarity. I celebrate. I win. Alright. Exhale. Next time, I’ll get back on track and make the “Golden Chicken with Cilantro-Cashew Pesto and Coconut Rice,” from the March 2016 issue of Cooking Light. Come back to my site next week, to see it.